We’d love your help. Let us know what’s wrong with this preview of The Middle Length Discourses of the Buddha by Bhikkhu Bodhi. This book offers a complete translation of the Majjhima Nikaya, or Middle Length Discourses of the Buddha, one of the major collections of texts in the Pali Canon, the authorized scriptures of Theravada Buddhism. 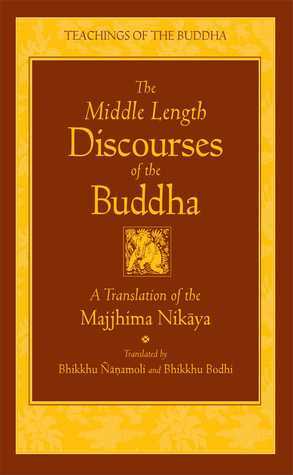 This collection--among the oldest records of the historical Buddha's original teachings--consists of 152 suttas or discourses of middle length, distinguished as s This book offers a complete translation of the Majjhima Nikaya, or Middle Length Discourses of the Buddha, one of the major collections of texts in the Pali Canon, the authorized scriptures of Theravada Buddhism. This collection--among the oldest records of the historical Buddha's original teachings--consists of 152 suttas or discourses of middle length, distinguished as such from the longer and shorter suttas of the other collections. The Majjhima Nikaya might be concisely described as the Buddhist scripture that combines the richest variety of contextual settings with the deepest and most comprehensive assortment of teachings. These teachings, which range from basic ethics to instructions in meditation and liberating insight, unfold in a fascinating procession of scenarios that show the Buddha in living dialogue with people from many different strata of ancient Indian society: with kings and princes, priests and ascetics, simple villagers and erudite philosophers. Replete with drama, reasoned argument, and illuminating parable and simile, these discourses exhibit the Buddha in the full glory of his resplendent wisdom, majestic sublimity, and compassionate humanity. To ask other readers questions about The Middle Length Discourses of the Buddha, please sign up. what is the essence of this book? NOTE: the following review applies to the 1995 edition. Two editions since have come out, the most recent in 2005. Some comments here likely do not apply to the most recent edition. If you purchase the book, try to ensure you are getting the most recent version. For my review of this translation I decided to take a different tack. Since I am not a Pali scholar I am not qualified to critique Bhikkhu Bodhi's (or Ven. Ñanamoli's) translation, so I thought I would turn to someone who is-nam NOTE: the following review applies to the 1995 edition. Two editions since have come out, the most recent in 2005. Some comments here likely do not apply to the most recent edition. If you purchase the book, try to ensure you are getting the most recent version. For my review of this translation I decided to take a different tack. Since I am not a Pali scholar I am not qualified to critique Bhikkhu Bodhi's (or Ven. Ñanamoli's) translation, so I thought I would turn to someone who is-namely, L.S. Cousins of the University of Manchester writing in The Journal of Buddhist Ethics (Vol. 4, 1997). Cousins criticizes the title, specifically the word "new," since most of the translation was done by Ñanamoli in the 1950s, not by Bhikkhu Bodhi in the 1990s. Indeed, in Cousin's view, Bodhi's contribution is fairly cosmetic in the sense of making the text more readable, and of lending more flexibility to certain Pali terms. In this sense he commends BB by making the text approachable to modern readers who are not themselves scholars. This is, however, about the only good thing he has to say of Bhikkhu Bodhi's work. -A lack of clarity as to which source text is being used. BB claims it is the PTS edition, but Cousins doubts this as the text often follows earlier Sinhalese editions that Ñanamoli likely had available. -No use of recent scholarship. -Many old mistakes are perpetuated, and even some inaccuracies that Ñanamoli had removed are reinstated. -Lastly, he notes BB's uncritical acceptance of the commentarial tradition, something I have harped on in other places commenting on BB's work. As regards the introduction, like Walshe's for his Digha Nikaya translation, Bodhi's is necessarily fairly basic, but does go further. For example, his discussion of certain critical terms such as dhamma, sankhara, namarupa, etc, is more informative. I always read introductions, but not everyone does-my wife, for instance, will not even read a two page author's preface. For someone in a rush (though I'm not sure how one would rush through a one thousand plus page book) and who is already well informed on these matters, the introduction is dispensable. Someone more beginning, though, would do well to read it carefully. On the Majjhima Nikaya specifically: This is the second of the five nikayas ("collections") that make up the Sutta Pitaka ("Basket of Discourses"). In accordance with its title, the 152 suttas ("discourses") here are not generally as lengthy as those in the Digha Nikaya, though they are often more substantive. The entire teaching, in some way or another, is touched on here, and some of the most important of the Buddha's discourses are included in this collection. It is repetitious, however, even with the generous editing of repetitive passages. There really is no way around this, though, and readers need to be patient. Not every discourse is a treasure; some are nearly verbatim reruns of previous ones. However, a benefit of this (if one is charitable) is that important issues are more likely to sink in deep; that is, you can begin to get a sense for where the real emphases are in the Buddha's Teaching. While it is important to be grateful to Bhikkhu Bodhi for his many years of labor on this and other works of translations, I am left scratching my head over why no able team of scholars has ever been put together in the way that Biblical translation teams are. Why is it always a lone translator trying to capture a literature that is many times more voluminous than the Bible? Certainly there are other monks, scholars and interested individuals who could add their talents to the project of translating Buddhist scriptures. It is high time that we stop relying upon the understanding and insight of individuals-always limited, however learned they may be-for our access to these vital documents. This is not a book to read like a novel. It is more like the bible. It took me 20 years to get through it. The man who gave it to me has since died and the world has moved on but the truths discovered by the Buddha live on. Those truths are repeated in various forms and parables and stories over and over. It is amazing how quickly the variables multiply as the Buddha enumerate states of being, ways of perceiving the world, emotions, senses, reactions, types of beings and stages of development: " This is not a book to read like a novel. It is more like the bible. It took me 20 years to get through it. The man who gave it to me has since died and the world has moved on but the truths discovered by the Buddha live on. Those truths are repeated in various forms and parables and stories over and over. It is amazing how quickly the variables multiply as the Buddha enumerate states of being, ways of perceiving the world, emotions, senses, reactions, types of beings and stages of development: "The six internal bases...the six external bases...the six classes of consciousness... the six classes of contact...the six classes of feeling...and the six classes of craving...need to be understood..." along with the Four Noble Truths and "the four foundations of mindfulness...the four right kinds of striving...the four bases for spiritual power...the five faculties...the five powers...the seven enlightenment factors...and the noble eightfold path." Yet the method remains simple. Like a Nike ad: just do it. The introduction to this collection is most interesting and should not be skipped. It is a commentary on the life and times of the Buddha that makes the Suttas more understandable. Most interesting for me is the glimpse into the historical past of India offered by the setting of many of the stories, where Householders are encouraged to give up everything to take up the simple robe and the alms bowl and seek an end to suffering; their own and others. There are very specific instructions about sitting and meditation which, while hidden among the advice and analysis of the other Suttas, provides a beginner's guide for the uninitiated student, but this is not for the beginner. Yet, the Sangha is important and it is all best understood when studied with guidance from an experienced practitioner. For that reason, and more, I remain a beginner, barely initiated into the meaning of the Buddha's teachings. The book, the Suttas, and the practice, however, all lead to greater enlightenment. Moment of contemplation. OM. I see no point in finishing all of the suttas right now. I have read 110 out of 152. Reading directly from the Pāli Canon is somewhat essential, in my opinion, if you want a clear understanding of Theravada Buddhism, yet I can not recommend anyone who does not practice the Buddha's teachings to read the Majjhima Nikaya. You are pretty much required to study the Pāli Canon to be able to understand all of it. And since I do not practice Buddhism, except agree with a some of its core teachings, I'm I see no point in finishing all of the suttas right now. I have read 110 out of 152. Reading directly from the Pāli Canon is somewhat essential, in my opinion, if you want a clear understanding of Theravada Buddhism, yet I can not recommend anyone who does not practice the Buddha's teachings to read the Majjhima Nikaya. You are pretty much required to study the Pāli Canon to be able to understand all of it. And since I do not practice Buddhism, except agree with a some of its core teachings, I'm happy to end my time with the Majjhima Nikaya here. The Middle Length Discourses in this translation aren't quite as accessible as the Long Discourses (Digha Nikaya) translated by Maurice Walshe, but they are certainly accessible enough. I found myself turning to the notes more often for explanations of phrases that sounded a little awkward, but had no trouble finding my way through the text. (Finding my way through the practice is another thing.) Indispensable for the study of early Buddhism. When I am walking on the path discovered by Buddha, the Majjhima Nikaya is like the home I can go back every time I got lost. Although repetitive at times, an excellent book. Very happy to have translations of the original Pali text considering how much Buddhism has changed over the years. I also appreciate the trimming down of the longer or extremely repetitive portions. What can I say about this wonderful book? A collection of 152 middle-length discourses by the Buddha and one of the core texts in the Pali Canon (and thus being the core not only of Theravada Buddhism, but also of all Mahayana schools), in which many topics are discussed, but most of them being about the development of mental quiescence and insight in order to attain arahantship, liberation from the cycle of rebirth and all suffering. The Buddha dialogues with a fascinating array of characters, ranging from naked ascetics to radiant gods, from old disciples to new devotees, from lay villagers to learned brahmins. And not only that, but the MN also includes some of the most famous suttas of the entire Pali Canon, such as the Anapanasati Sutta (Mindfulness of Breathing, MN 118) or the Satipattana Sutta (The Foundations of Mindfulness, MN 10), aswell as some other really memorable ones (my favorite ones being the "Hair-Standing Sutta" - really, but it was later named as the Great Discourse on the Lion's Roar, MN 12 - and the Angulimala Sutta, MN 86). All this is complemented by Bhikkhu Bodhi's beautiful translation and extensive annotations on the original text, which shed much light on translation nuances, unexplained contexts and further interpreations of obscure teachings. This is a fundamental text for any serious student of Buddhism, but it should be approached with as much patience (the style in which it is written is oral, so expect lots of repetition and mnemonic formulae) and some previous theorical preparation (such as already knowing something about the Three Higher Trainings or the difference between a Buddha and an arahant, or between the First and Second Turnings). If you fulfill both requisites, and take it easy on the text, slowly savoring each sutta, this is a marvellous text to own, read, and come back to, over and over again, over the years. ¿Qué puedo decir de este maravilloso libro? Una colección de 152 discursos de media duración del Buddha y uno de los textos fundamentales del Canon Pali (y por lo tanto siendo fundamental no solo para el Buddhismo Theravada, sino para todas las escuelas Mahayana), en el que se habla de muchos temas, pero la mayoría de ellos estando centrados en el desarrollo de la calma mental y de sabiduría con el fin de alcanzar el estado de arahant, la liberación del ciclo de reencarnaciones y de cualquier sufrimiento. El Buddha dialoga con una fascinante legión de personajes, que van desde ascetas desnudos a dioses radiantes, desde antiguos discípulos a nuevos devotos, desde aldeanos laicos hasta educados brahmins. Y no solo eso, sino que el MN también include algunos de los suttas más famosos de todo el Canon Pali, tal como el Anapanasati Sutta (Mindfulness de la Respiración, MN 118) o el Satipattana Sutta (Los Fundamentos del Mindfulness, MN 10), así como algunos otros suttas realmente memorables (siendo mis favoritos el "Sutta que Pone los Pelos de Punta" - de verdad, aunque más tarde se renombró a "El Discurso sobre el Gran Rugido del León, MN 12, - o el Angulimala Sutta, MN 86). Todo esto está complementado por la bella traducción de Bhikkhu Bodhi y las extensas anotaciones sobre el texto original, que arrojan mucha luz sobre sutilezas en la traducción, contextos que no se explican, e interpretaciones más avanzadas de enseñanzas poco accesibles. Notes toward an eventual review. #77 Mahāsakuludāyisutta struck me as particularly interesting in that the "Eight Bases for Transcendence" along with the descriptions of the practices for the four dhyanas and insight meditation, as presented here, appear to provide a possible scriptural basis for some of the later tantric practices which some claim were never taught by the historical Buddha. It also may be notable that the wanderer to whom the discourse is addressed, identified initially as Saku Notes toward an eventual review. I thought this book was very insightful. Might be helpful to know a bit about the foundations of the Buddha's teachings, a good outline may be found at: http://www.buddhaweb.org/, then read the Introduction in the book. Not all stories may apply or mean anything at first, but keep referring back to the foundations and see how they are "woven" in the stories. It's a must-have if one is seriously interested in the teachings of the Buddha, and it's not too big a volume for beginners. The greatest spiritual teachings collected into a single volume. Truly profound and timeless. A must read for all genuine seekers. Drawn to Buddhism in his early 20s, after completing his university studies he traveled to Sri Lanka, where he received novice ordination in 1972 and full ordination in 1973, bot Bhikkhu Bodhi is an American Buddhist monk from New York City. Born in Brooklyn, New York, in 1944, he obtained a BA in philosophy from Brooklyn College (1966) and a PhD in philosophy from Claremont Graduate School (1972).